In the past I have been guilty of poor installation of the odds and ends necessary for electric free flight. Allowing these to flop about within the fuselage is a recipe for solder joint failure and this has happened once too often for my liking. Accordingly, I made up a mounting plate to hold controller, switches, ESC header pins, release arms and servo DT as I have a habit of not planning and relying on good fortune to mount the controller components when the model is complete, not always with great success. I was quite pleased with the end result and thought that it might be of interest to anyone planning an electric conversion. The heart of the system is a Derek Knight E30 controller giving a maximum of 65sec motor run, a maximum of 320s DT and is load controllable. These are not yet available from Auntie Pauline, so contact Derek directly. These controllers are easily the market leader in the UK, are very easy to reset with a screwdriver and are largely bomb proof. Motor run time, motor load and DT time are controllable by positioning a potentiometer. The 'On' switch is a SPDT slider and boots the processor. 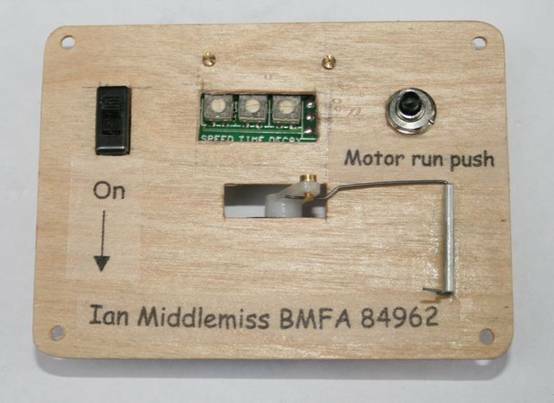 The controller then waits for the 'Motor run push' to be pressed before the motor runs up. This switch is a 'push to make'. 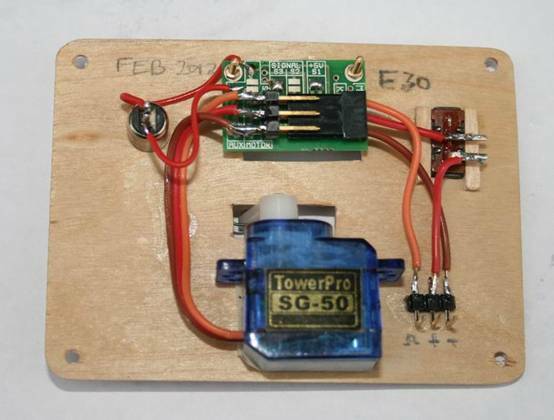 The servo is a cheap Tower Pro SG-50 and triggers a DT release arm when the set DT time is reached. The unit weighs 15.4gm. The cost of this including the £20 for the DK controller would be about £25. The square pins on the back of the unit lower left are pcb header pins and accept the Futaba plug that comes from the ESC. The switches, header pins and servo all come from Ebay. The release arm and mount are piano wire in an aluminium bearing, material readily available from your local hobby shop. The wiring is secured to the faceplate using UHU Por. All you have to do is connect the ESC Futaba plug to the faceplate. Connect a battery to the leads of the ESC, plug the outrunner to the ESC and you have a bomb proof electric power unit that does not dump semi decomposed hydrocarbons over your immaculate airframe. It starts immediately on request and does not require priming, excessive flicking and endless compression and needle valve adjustments for success. If anyone requires a duplicate of this system, I am happy to wire it up but I will need you to do ALL the mechanical work supplying the faceplate with components mounted ready to accept my wiring, heat shrink and soldering. You also need to stay with my component layout as it optimises the wiring layout and eases the soldering task. The mounting plate is 65 x 75mm. Before you glue the servo to the mounting plate, you need to position the servo arm using a servo tester using a 1ms input signal. 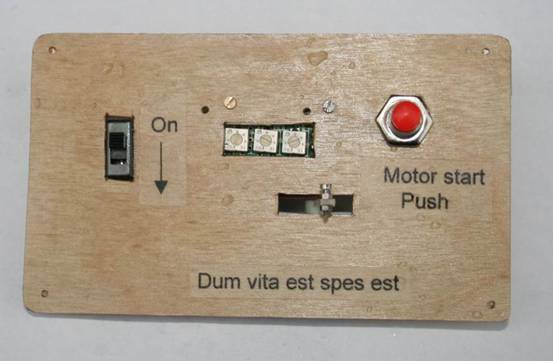 This is necessary because the screw holding the servo arm to the servo is inaccessible as the controller is in the way. If you cannot do this, give me a servo and I will set the arm position for you. Do not waste too much money on the servo. Find the smallest, lightest, cheapest servo you can find. The loads on it are very low and a 2-4 gm servo is all you need provided you arrange the release arm as shown in the picture. Here is a unit I wired up for Moley who will no doubt put it in some enormous cabin monoplane from the MAP X-List. Note the Latin quotation. Moley is a learned fellow and wished to share his erudition with his colleagues. This could be a wind-up as I am sure that he eyeballed me flying a Depron Mercurian Mite at the 4th Area meet at Barkston amongst UK F1X champions and £2k F1C screamers. Just getting in before he exercises his consummate wit and verbally destroys me.